The five stakeholders of the Partnerships for Development Results project – UNDP, the EU, Australia, Sweden and the US – held an annual meeting on Wednesday. At a waterfall in northeastern Buntrik-Yod Mon Wildlife Sanctuary a mature male elephant lay dead, with traces of a highly volatile bullet left in its mouth and its bud. Another AK47 bullet was found buried in its ribs. 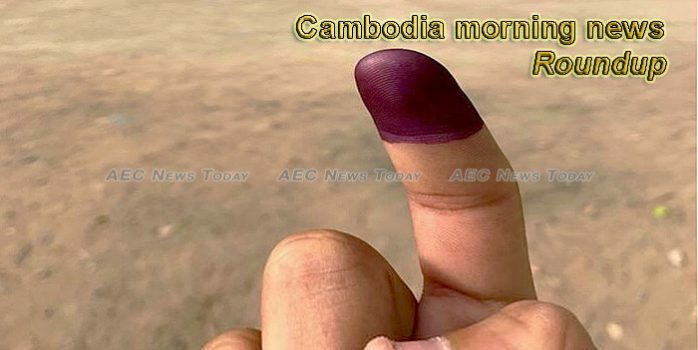 The Congress of Cambodian People’s Party (CPP) Central Committee decided to include seven more permanent members adding to 37 in total, according to CPP’s cabinet chief Mam Sarin on Thursday. Acting president of the opposition Cambodia National Rescue Party (CNRP) Sam Rainsy was on Thursday labelled “bewildered” by a senior government official after predicting that “99 per cent” of his party’s 118 banned former lawmakers would not seek a return of their political rights when a proposed law change takes effect. The National Museum on Friday took possession of a seventh century stone tablet after a pagoda in Kampong Speu finally agreed to let go of it after a year of negotiations. Cambodian authorities handed over 25 Thais to Thai police on Saturday after they had served 10 months in a Cambodian jail for working for a Taiwanese-led call centre scam gang. A violater of the lese majeste law continued to be held in jail in Siem Reap province despite having served his sentence, after an appeal from the provincial prosecutor blocked his release. Fifty-one migrant workers working illegally in Thailand were deported on Wednesday through Banteay Meanchey province’s Poipet International Border Checkpoint. The Cambodian embassy in Thailand on Friday clarified that more than 50 migrant workers who returned to the Kingdom through the border in Poipet city last week were not fired by a factory but were in fact working illegally and returned home to get required documents. The Prime Minister Hun Sen has ordered the ministries to decentralize and bring their services to subnational levels by 2020. Cambodia Prime Minister Hun Sen alleged Friday that the main opposition party he had banned last year is spreading fake news, while it emerged that his government has exerted heavy-handed control of a purportedly independent outlet. A senoir Cambodia People’s Party (CPP) official has rejected accusations that the appointment of more than 100 advisers is a waste of government money, saying it will in fact boost efficiency. Finished studying Phnom Penh-Bavet Expressway, Minister of Public Works and Transport Sun Chanthol said Thursday that the 130km-expressway connecting Phnom Penh and Bavet on the border with Vietnam will come at a cost of $3.8 billion, addressing at the inauguration ceremony of the LM17 port terminal phase II in Kandal Province. It’s only been a few days since an Omni Air flight carrying 36 deportees, rounded up and detained by ICE earlier this year, landed in Cambodia. But already, immigrant communities in the Bay Area and across California are bracing themselves for more. Some three tons of African ivory sat in an unmarked crate in a Cambodian port for more than a year, until a tip from the U.S. embassy led authorities to break it open this week and discover the country’s largest-ever haul of trafficked ivory. The General Department of Customs and Excise’s Department of Crime Prevention and Suppression this week seized approximately 20 untaxed vehicles which bore illegal government licence plates. The Muslim residents of Poipet town are seeking intervention from Prime Minister Hun Sen after a court ruled in November against returning a 160sqm plot they claim belongs to their mosque. Cambodian economy has been projected to grow by 7.3 percent this year, spurred by the robust performance of garment exports, tourism and construction, Deputy Governor of the National Bank of Cambodia Neav Chanthana said Friday. The Medical Laboratory of the Pasteur Institute in Cambodia has become the first medical laboratory in the Kingdom to be awarded ISO 15189 accreditation, following a six-year quality improvement initiative to meet international standards, laboratory deputy director Cheng Sokleaph said on Thursday. Visa Inc. in cooperation with the National Bank of Cambodia (NBC) and other private banks launched Visa QR payments at Sofitel Phnom Penh Phokeethra on Dec. 20. A Cambodian businessman is set to become the saviour of financially beleaguered Polish football giants Wisla Krakow after recent reports that a Cambodian-British consortium is closing in on a takeover of the club. On December 21, 2018, police detained 10 businessmen at Tuol Pagoda for questioning for violating intellectual property rights. The Khmer Arts Academy opened its doors on Saturday to let the public see parts of Cambodian culture you don’t always get a chance to see.